1. Cleaning up and getting ready for the next day. Having your kids clean up before dinner will lead to an easier cleaning up after dinner. Whenever you clean up, tidying up one’s personal and common space is an important habit to have – this including the adults in the family. Getting ready for the next day could either be setting out clothes for the next day, or at least just deciding what to wear. You can also look into knowing your child’s school schedule. If it’s a school night, you might want to make sure your kids have what they need for the next day – is it library day? Does he need gym clothes? Does she have all her homework? Where is the backpack anyway? 2. Getting ready for bed. 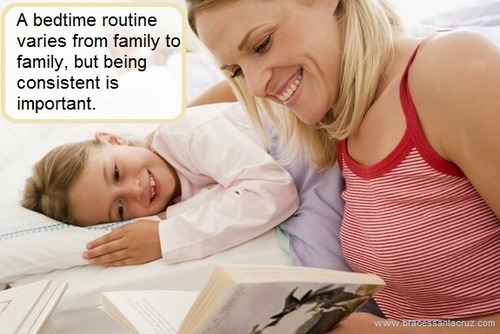 This part of the bedtime routine is probably pretty similar from household to household. This includes having the kids get into their pajamas, brushing teeth, and putting dirty clothes in their hamper or dirty clothes basket. 3. Reviewing the day together. This part of the bedtime routine is tempting to not do some days in the interest of time. However, it is the most important because your kids get to talk and spend time with their parents after a long day. In some families, this is the part of the day they go over the kids’ reward charts talk about how the day went. This generally helps with sibling relations and reduces sibling fighting, because kids talk to each other about problems or disagreements after the emotion is behind them. If you’re still awake at this point, it’s a nice time to have some private time with each child, even if it’s just a few minutes. This could be reading or just cuddling together and talking. Anything that gives them your undivided attention even for a short time. This is especially crucial for families with multiple kids. Give these ideas a try for creating a successful bedtime routine. Like anything else, implementing a routine consistently is the key, and every parent surely wants to spend special time with their kids.